You can buy elastic thread gathered fabric by the inch at a fabric store or you can make your own in the fabric of your choice. The following directions will create a sundress or nightgown which will fit adult sizes small to large. Fabric — 60" wide lightweight fabric, and light to medium weight knits lend them self to gathering with elastic thread. A heavy or stiff fabric will not give you good results. A sundress that will fit small to large requires 1/4 to 1 yard of fabric for the length of the dress. (If a larger dress is desired, you will need to "gather" the length of the fabric rather than the width. Purchase at least one and a half times the fabric of the widest body measurement.) Purchase extra fabric if straps are desired. Threads — You will need thread which matches the fabric and a spool of elastic thread. Purchase new elastic thread, not elastic thread that has been in a sewing box for ages. Elastic does age and will lose its elasticity over time. A sewing machine and two bobbins (one for regular sewing thread and one or more for the elastic thread). Thread the sewing machine with your regular sewing thread (bobbin and upper thread). Square the fabric making sure that both cut edges are straight. To sew with elastic thread, you must hand wind the bobbin. Do this without stretching the elastic thread. Wind the elastic thread on the bobbin until the bobbin is full. Thread the top of the sewing machine with your regular sewing thread. Place the bobbin in the sewing machine and thread the bobbin as you would regular sewing thread. Leave a thread tail of the elastic thread and bring the elastic thread up through the sewing machine throat plate. Always leave a couple of inches of thread tail when you stop sewing with elastic thread. 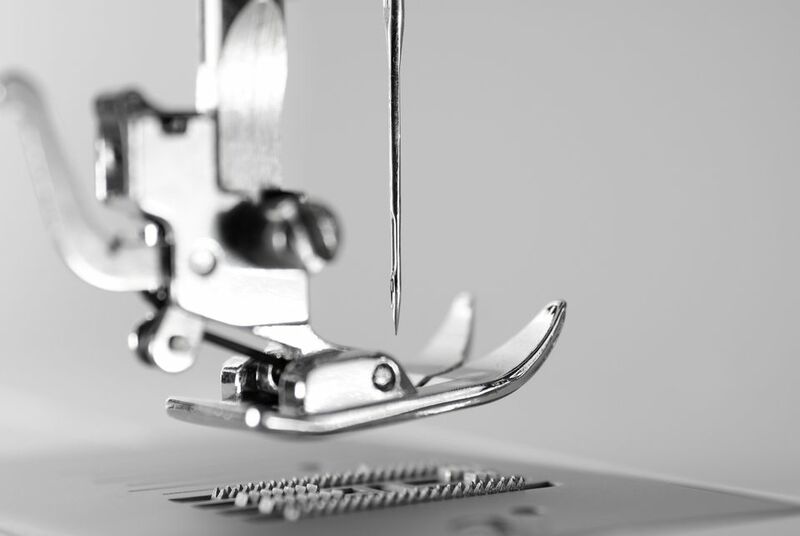 ​Do not use automatic thread cutting features on your sewing machine while sewing with elastic thread! The automatic thread cutter will not leave a long enough tail, causing the end of the elastic thread to pull back into the bobbin case and you needing to re-thread the machine. Set your stitch length at 3.0 or longer. Test the set up on a scrap of fabric. The weight of the fabric and the stitch length will both affect the amount of bunching the elastic thread will create. With the right side of the fabric up, beginning just under the hemmed edge, sew a row of stitching an even distance from the hem. Repeat sewing rows of stitching an even distance (approximately 1/4") from each other, using your presser foot as a seam guide. Sew 2" to 12" of elastic bobbin rows of stitching depending on how much gathered area you desire. For a comfortable summer nightgown, 2" is sufficient on a very lightweight fabric. For the elasticized fabric to cover the bust area, sew 10" to 12" worth of rows. Re-thread the sewing machine with regular thread in the bobbin and upper thread. Aligning the top edge and the selvages, pin the selvage edges together. Sew a seam that is 1/2" in from the selvages, on the body of the fabric. Cut two 2" strips the width of the fabric. Fold in 1/4" on each end, bringing the wrong sides of the fabric together. Press the length of the strip in half. Press each edge into the pressed line, placing wrong sides of the fabric together. Refold and align the folded edges to match. Sew as close to the aligned edges as possible, pivoting at the ends to sew the ends closed. Fold the length of the sewn strips in half and cut on the fold. Try on the sundress and pin the ties in place so that they will tie on the shoulder. Sew the ties in place on the top hem. Try on the dress and decide the desired length. Add 2 1/2" to the desired finished length. Trim away any excess fabric. Turn under 1/2" and press. Turn under 2" and press in place. Hand sew or use your sewing machine blind hem to sew the hem in place. Add 1" to the desired length and trim away any excess fabric. Turn under again and press in place. Sew in place, sewing as close to the fold on the body of the fabric, as possible.